Design for installation in commercial HVAC systems UVMatrix™ AS-Series systems are designed to meet the challenge of dramatically reducing microbiological contamination of commercial and institutional indoor environments. 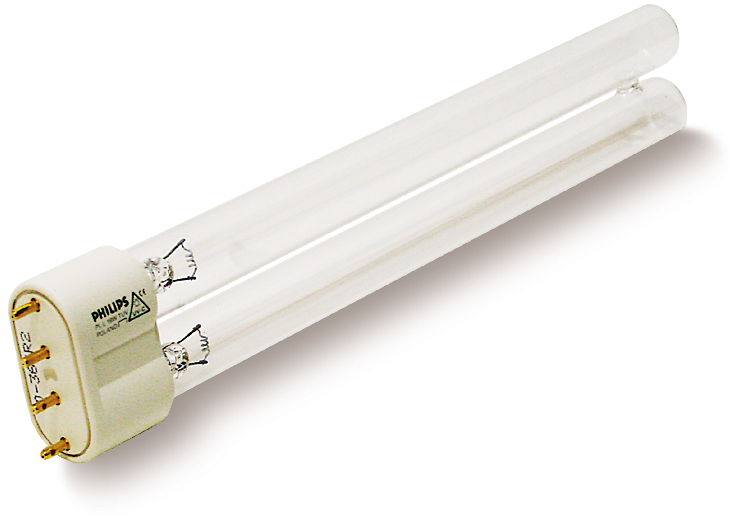 The AS-Series is specifically designed for airstream applications combining lamp arrays T3 lamp optimization and Philips Compact-Twin UV lamps. AS-4/9UV System with four 9" lamps w/T3 Quartz no options. AS-4/16 UV System with four 16" lamps w/T3 Quartz no options. AS-4/20 UV System with four 20" lamps w/T3 Quartz no options. AS-6/9 UV System with six 9" lamps w/T3 Quartz no options. AS-6/16 UV System with six 16" lamps w/T3 Quartz no options. AS-6/20 UV System with six 20" lamps w/T3 Quartz no options. 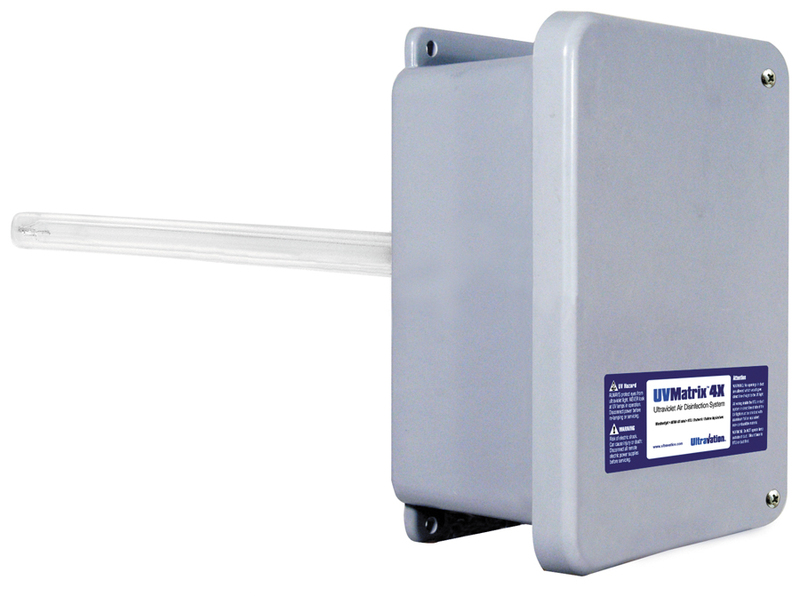 The 4X-Series is designed to be used in rooftop, packaged systems or other outdoor application. The cabinets are fiberglass and weather tight for outdoor use. Dry contacts provide interface with remote monitoring devices. 4X-112 Outdoor UV System with 12" lamp w/T3 Quartz. 4X-122 Outdoor UV System with 22" lamp w/T3 Quartz. 4X-133 Outdoor UV System with 33" lamp w/T3 Quartz. HVAC component irradiation with uv prevents mold and other biological contamination from infesting the moist HVAC system surfaces. UVMatrix SI not only provides ample UV to accomplish this, its 360 degree dispersion offers significant residual airstream disinfection as well. Installation is made easy through a horizontally expandable chassis, so that any system can be fitted for optimum performance. UV UVMatrixTM SI-2/G36 Adjustable Rack UV System with two 33" lamps w/T3 Quartz. UVMatrixTM SI-4/G36 Adjustable Rack UV System with four 33" lamps w/T3 Quartz. UVMatrixTM SI-6/G36 Adjustable Rack UV System with six 33" lamps w/T3 Quartz. UVMatrixTM SI-8/G36 Adjustable Rack UV System with eight 33" lamps w/T3 Quartz. 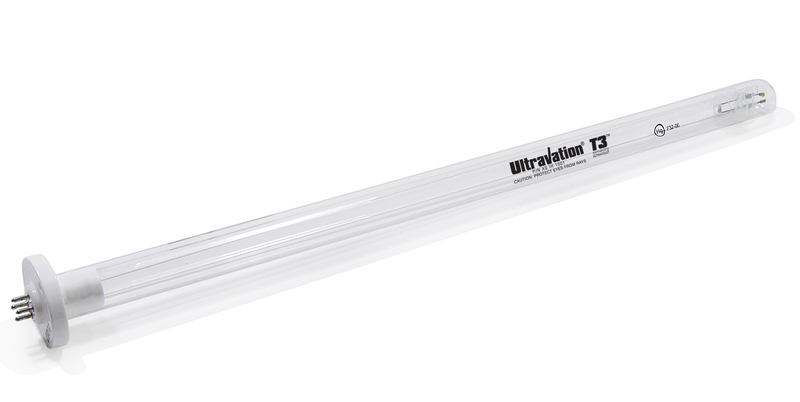 UVMatrixTM SI-2/G64 Adjustable Rack UV System with two 62" lamps w/T3 Quartz. UVMatrixTM SI-4/G64 Adjustable Rack UV System with four 62" lamps w/T3 Quartz. 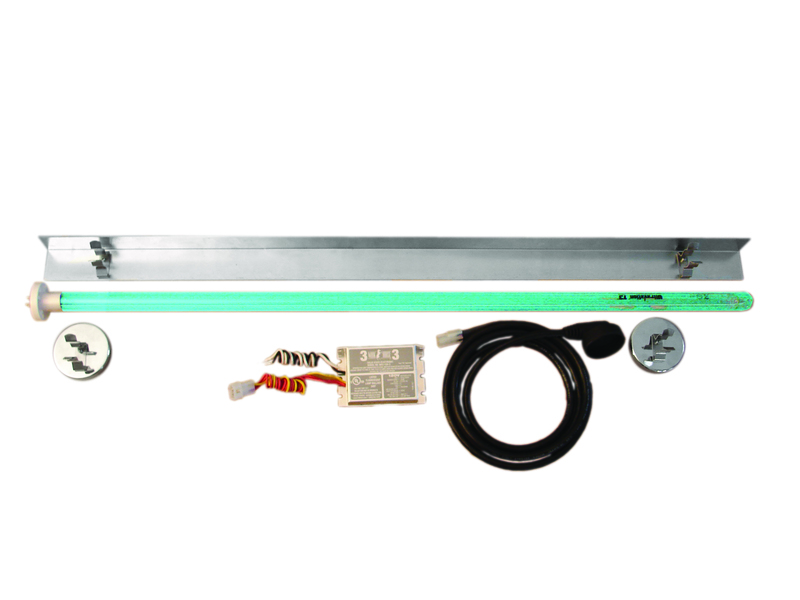 UVMatrixTM SI-6/G64 Adjustable Rack UV System with six 62" lamps w/T3 Quartz. UVMatrixTM SI-8/G64 Adjustable Rack UV System with eight 62" lamps w/T3 Quartz. 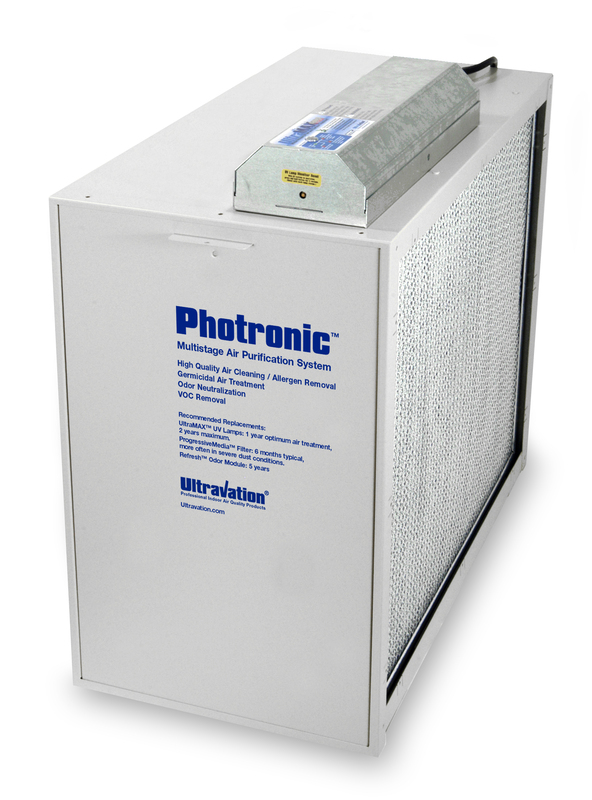 Photronic™ uses a unique set of technologies that addresses each of the common causes of indoor air pollution. 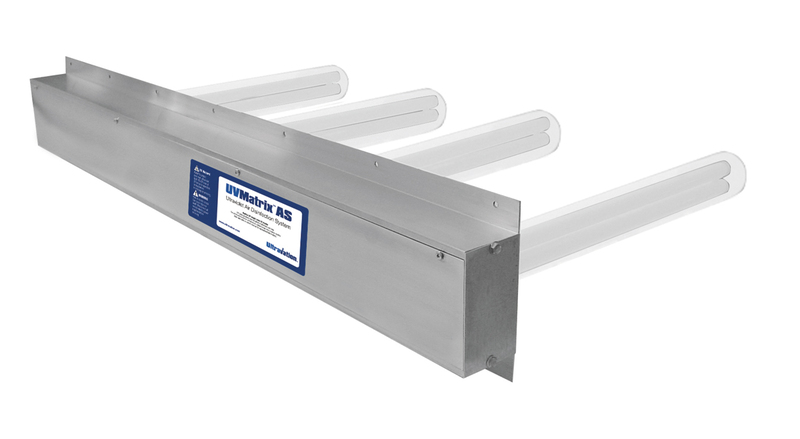 UVMatrix UV systems for commercial HVAC systems use UVC light to kill microorganisms on coils, surfaces and airstream—including mold, flu viruses and bacteria. The EZ system which comes in three lamp lengths can be used in hard-to-fit specialized HVAC or cooling equipment such as ice machines where controlling bio-growth on cooling coils is vital. Innovative "U" shaped design enables Philips Compact-Twin lamps to deliver the output of lamps twice as long--and they fit in the tightest spaces. Using far less mercury than (less than 5mg per lamp) they provide consistently higher output over the life of the lamp.Non-ozone producing. LP-PP-0001 9" UV U-Lamp for Models UME & UVS 1000, 2000. LP-PP-0002 16" UV U-Lamp for Models UME & UVS 1036, 2036. Ultravation designs for top performance every step of the way and T3 is great example. A T3 system encases UV lamps in special UV transparent quartz glass. The quartz enclosure and gas inside the chamber insulates the actual lamp from the cold HVAC air passing by, allowing the lamp operate at a higher, more optimum temperature. T3 enhances the positioning of Ultravation's remote lamp equipment and delivers more germ and mold killing UV at the target. AS-IH-1001 12" UV Lamp w/ T3 For Models UVR, UME & UVS 1200T, 1202T. AS-IH-1003 17" UV Lamp w/ T3 For Models UVR, UME & UVS 1900T, 1902T.